Frittatas are a versatile dish that can be served at breakfast, lunch or dinner. 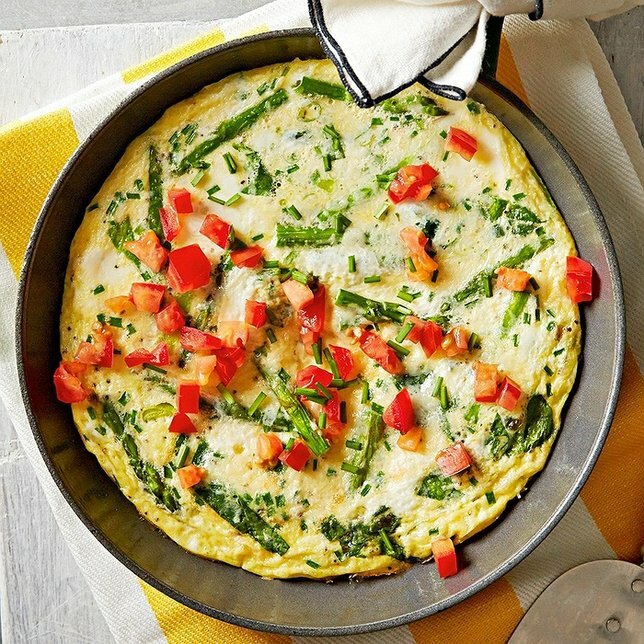 This easy frittata, featuring green spring vegetables accented by chopped tomatoes and parmesan cheese, can be on your plate in just 25 minutes. Directions: Preheat broiler. In a small bowl combine the eggs, egg whites, milk, chives and pepper: stir in 2 tablespoons of the cheese. In an 8-inch nonstick broiler proof skillet heat oil over medium. Add asparagus and green onions; cook and stir 2 minutes. Add spinach and garlic; cook 30 seconds or just until spinach is wilted. Pour egg mixture into skillet; reduce heat to low. Cook, covered, 10 to 12 minutes or until nearly set. Sprinkle with remaining 2 tablespoons cheese. Place skillet under broiler 4 to 5 inches from heat. Broil 1 minute or just until top is set and cheese is melted. Top with tomato. Directions: Preheat oven to 350°F. Line a 2-qt. rectangular baking dish with parchment paper or foil. Place squash halves, cut sides down, in the prepared dish. Bake 30 to 40 minutes or until tender. Meanwhile, in a large nonstick skillet cook sausage and onion over medium-high 3 minutes or until onion is tender. Add apple; cook 3 to 5 minutes more or until apple is tender, stirring frequently. Reduce heat to medium. Push sausage mixture from center of skillet. Pour oil into center; add egg. Cook, without stirring, until egg begins to set around edges. Continue to cook, stirring frequently, 1 to 2 minutes or until egg is cooked through. Stir egg into sausage mixture to combine. Using a wide metal spatula, carefully turn squash halves, cut sides up, and sprinkle with salt. Brush tops and insides of cavities with 2 teaspoons of the syrup. Fill with sausage mixture, pressing lightly to fit if needed. Sprinkle with pecans. 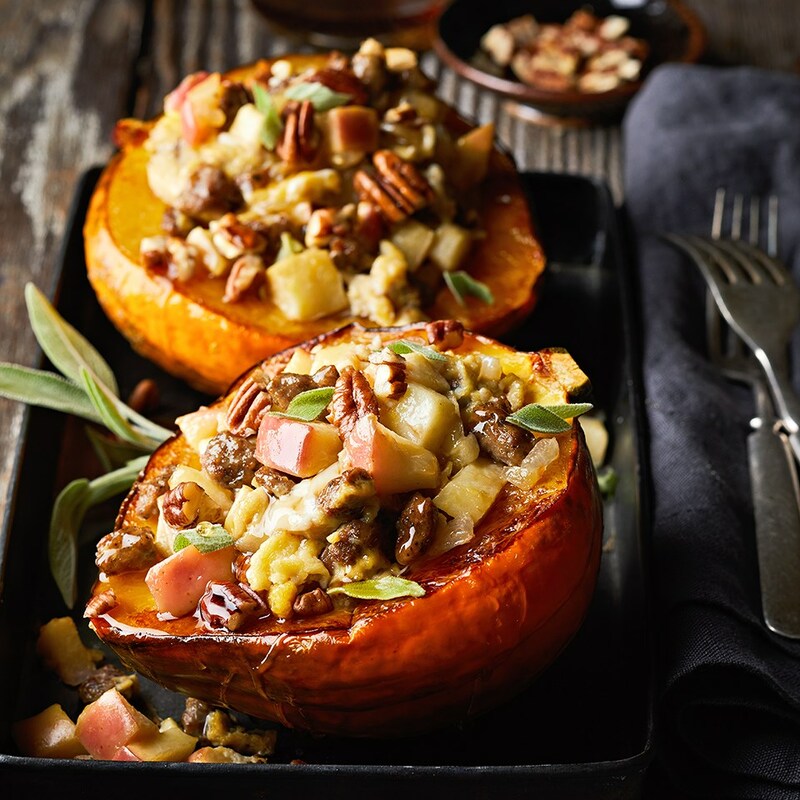 Bake 10 minutes more or until stuffed squash is heated through and pecans are lightly toasted. Drizzle with the remaining 2 teaspoons syrup and, if desired, top with sage. 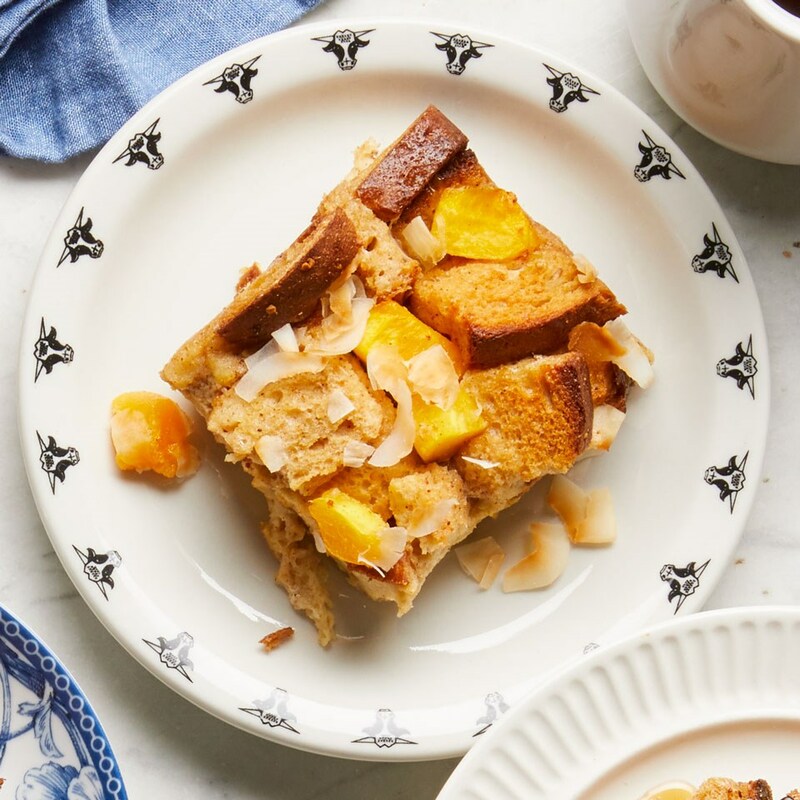 Mango, nutmeg and coconut give this healthy breakfast casserole recipe tropical flair. If you can't find a ripe mango, pineapple is a good substitute. Directions: Coat a 9-by-13-inch baking dish with cooking spray. Toss bread and mango in the prepared pan. Whisk eggs in a large bowl. Add milk, butter, brown sugar, nutmeg, vanilla and salt; whisk to combine. Pour the custard over the bread mixture. Sprinkle with coconut. Coat a piece of foil with cooking spray and cover the pan, coated-side down. Place another 9-by-13-inch baking dish on top as a weight. Refrigerate for at least 8 hours or up to 1 day. Preheat oven to 350°F. Remove the top baking dish, leaving the foil in place. Let stand at room temperature while the oven preheats. Bake the casserole, covered, for 45 minutes. Uncover and bake until golden, 20 to 25 minutes more. Let stand for 10 minutes before serving. Subject: LongIsland.com - Your Name sent you Article details of "Try These Three Spring Brunch Recipes"